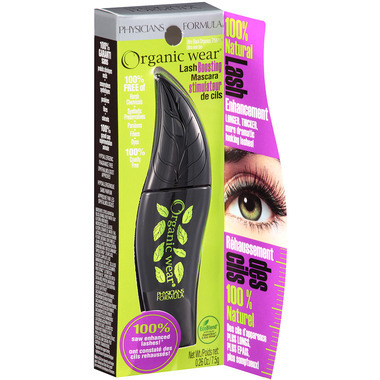 Physicians Formula Organic Wear Lash Boosting Mascara is the 1st Ever 100% Natural Lash Boosting formula enhances the appearance of lash length, thickness and volume for dramatic lashes instantly and long-term. 44% of the Total Ingredients are from Organic Farming. 100% saw enhanced lashes INSTANLY! Delivers ingredients to the base of lashes for best results! 93% saw thicker & longer looking lashes instantly! 92% saw extended & fuller looking lashes after 4 weeks! *Based on individual perception of results of a panel of women wearing Organic Wear Lash Boosting Mascara. Hypoallergenic. Fragrance free. Ophthalmologist approved. Gluten Free. This one made Kris Carr's list of top picks. For the price point and good ingredients it is a keeper. I wasn't amazed. Wish there was more volume. I had heard good things about this mascara but i did not like it at all. It stays wet all day and smudges easily. I liked this mascara. I only used non synthetic makeup and this one holds better than most others. I even need a make-up remover to clean it all off! When it rains, I use the waterproof one. Really excited about this product, unfortunately it does exactly what the description says it does not do... it flakes... everywhere. I have racoon eyes and mascara-free eyelashes in just a few hours. Terrible mascara. It appealed to me for being non toxic and cruelty free. Unfortunately my lashes are also free of mascara as it's all smudged under my eyes! Don't buy! Was so disappointed with this, thought I was doing my bit for the environment and it was an awful product.I would never recommend this product. It was only fit for the trash as it smudged everywhere, not even the cheapest of mascaras do that! Not happy with this formula. I have used their mascaras for a while and this is the first one that has irritated my eyes. Either I'm allergic to this formula or the flake off is getting into my eyes. I'm looking for a replacement. It leaves black smudge under my eyes, so I will not buy it again. I gave 2 stars because it has no harmful/toxic ingredients and it goes on very smoothly. Goes on nicely, but for me it smudges quite a bit under the eye. Goes on without clumping or flaking. Stays on all day. Great product. I like this mascara but don't love it. It goes on smoothly and doesn't clump which is great BUT it does flake off so I have to check throughout the day to make sure I don't have black smudges on my face. I love this product! It goes on so smooth, I no longer have issues with clumping. Really good! Goes on without clumping and only smears if you rub your eyes. The black looks nice and natural, unlike other brands. Great natural product. I've used other natural mascara's but this one is affordable, and is sold in most stores. I wish it would not, run, smudge, I have found that the natural mascara's don't stay put but this is the best of the ones I've tried. I do like that it washes off with soap and water. I love this mascara, it's better than the conventional kind I've been using! It looks far more natural too! I really would perfer organic mascara and this was my first but had too discontinue due to continual running and not staying put. My favorite mascara. I love the more natural products and this mascara is easy to find! I love that it can wash off with water only! So gentle! I like the fact it's free of chemicals but not happy it runs on me. I'll go back to the one in the green container. This mascara is really beyond others in its category (organic/natural). I've had bad experiences with lots of other brands of natural mascaras, but this one is as good as any chemical-filled mainstream brand. I've also tried two other types of mascara by Physicians Formula and find that the Lash Boosting one is the best. Thank goodness, a mascara I am not reactive to. I have developed makeup allergies and react to almost everything. This product is very well reviewed on the environmental working groups database for safe products and I am impressed. Container is cute too! I like this product. It is easy to apply multiple layers, as it doesn't completely harden to the lashes. That being said it is also easy to smudge around the eye if you are prone to rubbing or wiping at your face unconsciously. I like the long sleek look it gives and at the end of the day it is simple to wash off. I haven't had an issue with it clumping or irritating my eyes. I would definitely purchase another Physicians Formula mascara. I waited for about two months to rate this because I wasn't really sure from the beginning if I liked this mascara or not. It goes on really nicely, and of course, the "natural" features are very nice. But the truth is, this mascara runs more than any other I have ever tried! Hourly I'd have to go to a mirror and rub it off from under my eyes. I found myself feeling embarrassed regularly when I realized I had a conversation looking like I did. Yesterday I purchased a Cover Girl product (at half the price) and was immediately reminded that mascaras don't have to do that! I will not be buying this again. Terrible mascara - do not buy! Smudges under eyes...really bad! Never happened with any mascara before. Sent email to company (Physician's Formula) and asked for reimbursement because this can't be worn without smudging and they didn't even bother to answer my message. Never again! I really like this mascara. It doesn't dry too quickly and allows for me to add multiple layers and correct any lashes that may have attached together before it dries. The one complaint I have is the brush is a little big and I get a lot of mascara on my eyelids. It does come off very easily, but I've never had it smudge or runoff. I've worked out and played volleyball with no mascara running. The fact that it's natural, and the low price are the great things about this mascara. Downsides are that it doesn't seem to have the dramatic effect I prefer, and it comes off ALL DAY LONG. Even without water or tears, it flakes and clumps off constantly, so that by the end of the day, I've got sparse lashes, and black smudges and chunks all around my eyes. I'm willing to pay more for other natural mascaras that stay put longer. Really really nice mascara. Lashes feel softer and look very nicely defined and full. But 3 stars because it doesn't stay throughout the day and I end up with it under my eye and in my eye. It wipes easily away with water though. So if you are up for reapplying and wiping the mess under your eye throughout the day it works. Nice alternative to the chemical filled ones. But no stay power. This is a nice mascara for when you dont need super long, all-day wear. I do find it smudges easily, but I do touch my eyes a lot and have oilier lids. Easy to get off and not irritating at all. I'm happy with this as my first "green" mascara. My lashes stay soft after application and the mascara washes off easily with my face cleanser. I'm not crazy about the brush, but it's not the worst I've ever used either. So far of the 5 natural mascaras I've tried this is my favorite, both for price and quality. I am only giving it 4 starts though as it does not totally dry but stays a bit damp/tacky, just don't rub your eyes after applying! I did not find it runs under normal use, and I've worn it when I've spent time working outside all day though I haven't tested it in the rain yet. A good product, doesn't clump. I love it! Keeps eyelashes soft, easy to apply, I didn't experience any running so far, nor any irritation. Perfect! This is a great mascara! I had been looking for one that was more natural and also didn't bother my eyes. This one is both of those things. Also a bonus is that it is easy to take off at the end of the day. I love this mascara. Its light on my lashes and I have never had clumping issues. It consistently separates and coats every lash. It does smudge easily, but thats because its natural and doesn't have a bunch of chemicals to keep it glued to your eyelashes. Which I think is a good trade off. It takes a few coats to get full coverage, but again, its always a nice fan of eye lashes, never clumped together. Love it. And no irritation to eyes either. Very good mascara, non irritant to the eyes, and add volume, would definitely recommand, it is not waterproof though, it can run if wet, but very gentle to the eyes. The best I have used. You don't feel your wearing mascara yet provides full lashes with no irritation. Great for sensitive eyes/skin. Brush is a bit big but you can learn to use it and still get results. This mascara is 100X better than non-natural mascaras and come on ladies, WHY were we putting non natural elements near our EYES, anyway? It does take a bit longer to dry that pharmacy mascara, but it is worth it jsut don't sneeze for 1 minute ;) Please switch over to this mascara, you won't be disappointed. It is not waterproof, but I prefer that for make-up removal. Definitely recommend! I like this mascara because it's organic. It goes on well and doesn't clump. Only problem is a little crying or sweating and you end up looking like a raccoon. Best to keep a little pocket mirror handy. Your sale price first drew me to this mascara. Now that I am using it, I love the texture and gentleness effects. No more sensitivity issues from mascara. It does smudge if accidentally rubbed, but it is also easy to remove at day's end and that is a plus. Thank you for the attractive pricing that convinced me to give it a try. I love that this mascara is natural and chemical-free. Also a bonus that it's gluten free, for those who have gluten allergies. Easy to apply and not clumpy at all. I'll be using this all the time, from now on. This is an excellent product. I have sensitive eyes and many mascaras make my eyes water, which in turn, can ruin my mascara. This makeup, as mentioned, can smudge in the humidity but otherwise it's fantastic. This is a good product. It lengthens and isn't clumpy. The only thing is it tends to smudge if it's humid or sweaty a bit. If your aware of that and check once in a while for dark circles it's great.